I started on a health kick when I returned from my last trip. While I was away I ate however I wanted; chips, ham, beef, bread from Ireland, fried cheese, kabobs and pastries from Turkey and giant pretzels from Germany. Sure, it was delicious, but I really needed to back off, especially because we have all of those things in America and worse – they aren’t as good so you feel like you need twice as much! Well here I am off white breads and fries and I’m really feeling the pain. On Thursday I had made some homemade applesauce. 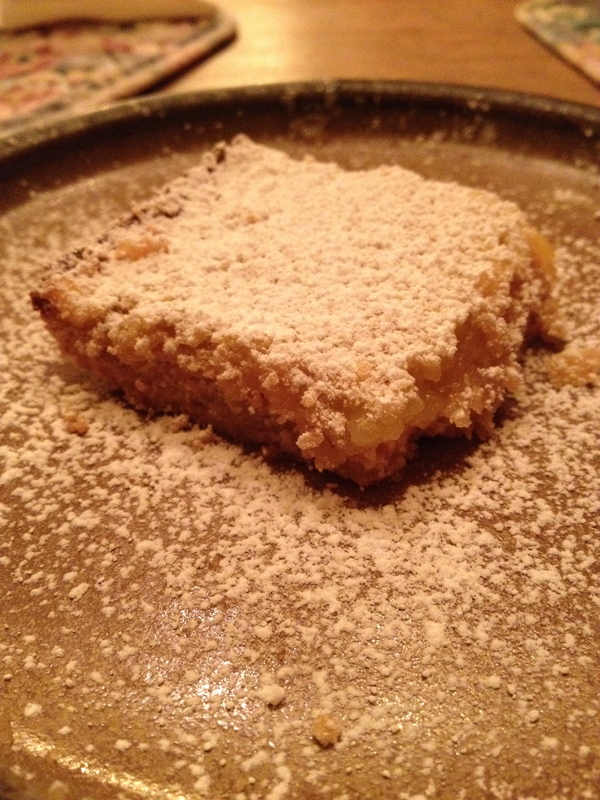 There is hardly any added sugar in it, but it just smells and tastes sweet. I took a bunch of sliced apples, skin on and boiled them down with cinnamon, cloves and nutmeg. This got me thinking of pork chops. I just love the flavours of apple and pork together. Pork chops and apple is such a fall meal too; it’s warm and hearty and decadent. My idea for the potatoes spawned from my NEED for fries, but I couldn’t have them! So I chopped an onion and potatoes and threw them in a casserole dish and baked the crap out of them. I added some cheesy pull apart bread for those that could have it because I thought cheddar and apples – who can go wrong with that. 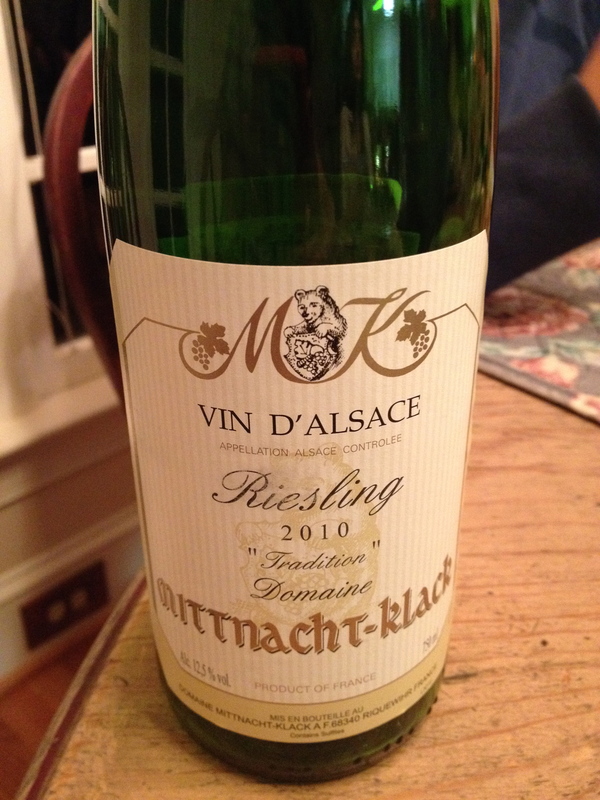 I chose a dry Alsacian … Alsation – well it was from Alsace – Riesling, from Raleigh Wine Shop. I thought a Riesling from this area would work the best because I didn’t want sweet, but I love the taste of Riesling with white meats and light tasting foods (potatoes, apples). 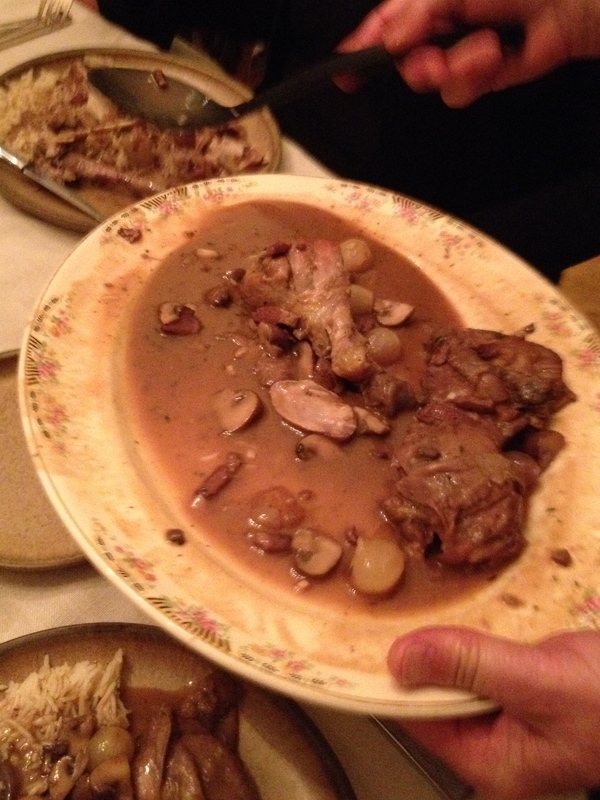 There was barely any smell to it, but the taste was excellent. Medium-bodied for a Riesling, enough weight in the mouth and the citrus worked nicely with the meal. 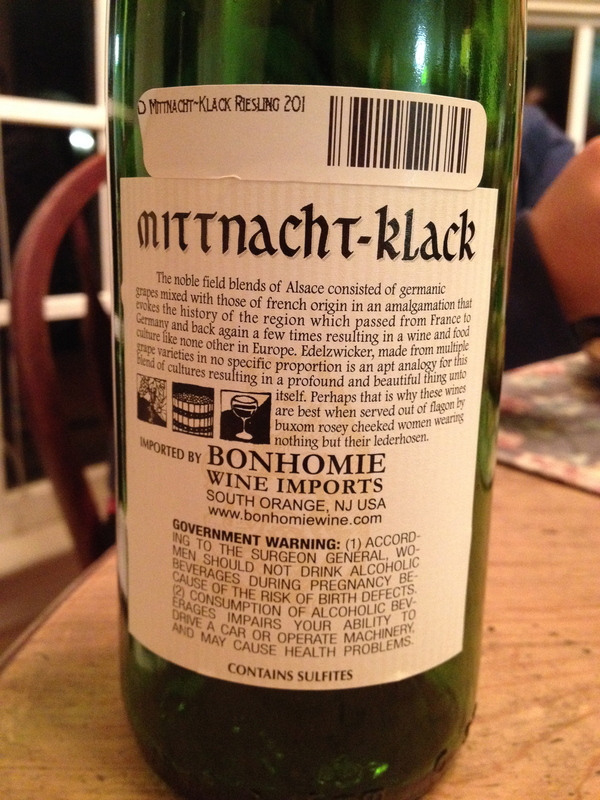 As my family tasted it, we agreed that the meal was making the wine taste better. 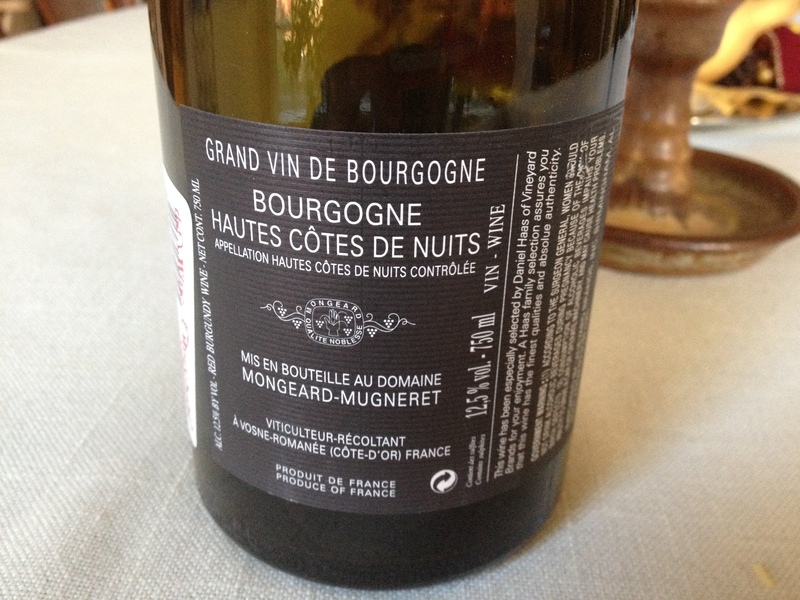 The flavour of the pork and spiced apples help create the roundness of the wine – to complete it. For those who think all whites are bad and also that they should be left to summer, I must implore you to change your mind. German whites aren’t harvested in the summer, they are barely grown in any heat at all – it’s cold up North. 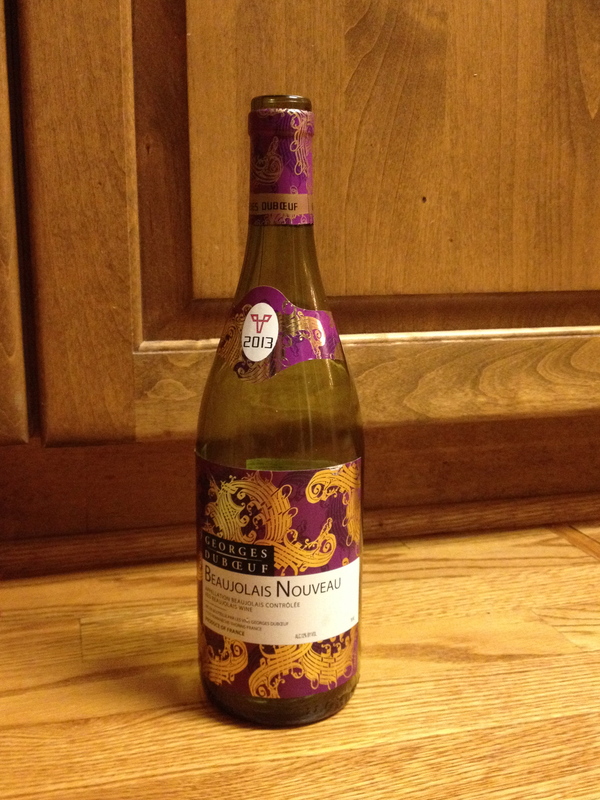 Although this is a French wine, it takes on the nature of it’s German neighbor – it is great with fall foods, it’s dry and light. It doesn’t even need to be chilled all that much, in fact ours was probably around 40° F. I fear any colder and we might have lost valuable taste. Anyways, that’s just my spiel, wines should get equal tasting! 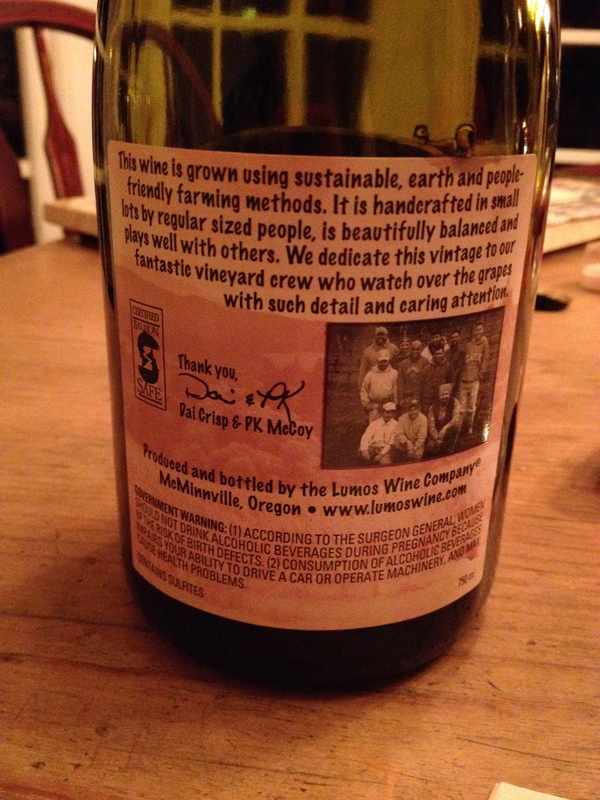 On the back of the wine, there is a nice little anecdote. 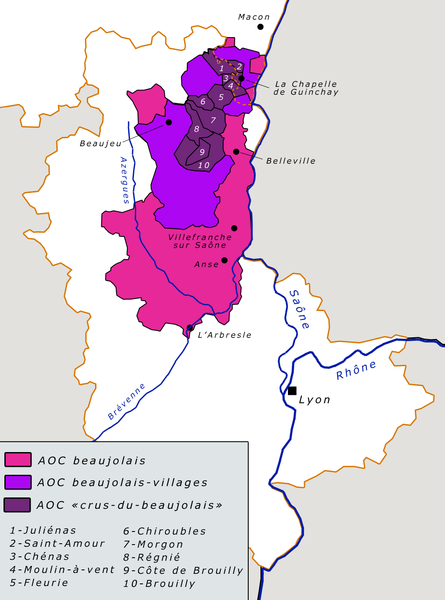 It only makes me want to visit the lands between France and Germany more where Alsace resides. 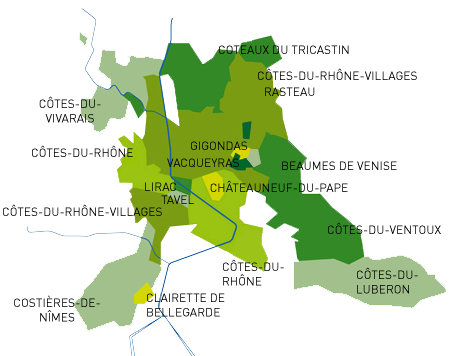 It’s an area that has been fought over many times and has resulted in becoming a wonderful mix of cultures. I hope to one day visit and walk from one country to the other, I hear it’s beautiful. There nothing quite like Sunday night dinners with the family and the few here in North Carolina is really only half of mine. For the next few weeks I’m going to plan, buy, create and blog about a dish and wine pairing randomly chosen. (Well, not too random, I’ll choose the varietal) I’m going to pick a dish and the varietal I believe to pair nicely with the food, then go and choose a wine from one of our fabulous North Carolina owned and operated wine stores. Trying new wines is one of the ways we learn more about wine. There is something to be said for finding our favourites and always buying those, but new wines are being made everyday! Our flavour profiles change as well. One day you may not like beets and the next you find you love them. Beets have an earthy flavour, which could in turn change your love of earthy tasting wines. It happens! 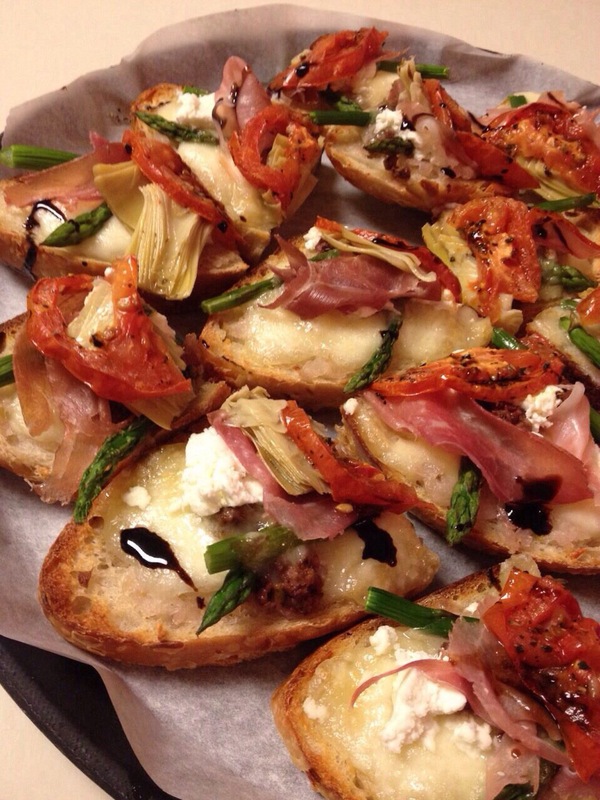 I’ll be doing these Sunday night dinners until Thanksgiving. Hopefully you’ll learn something new, either about wine, about food or about yourself. Let’s get started. I never really liked chili until I had my father/brother’s recipe. It’s got ground beef, chunks of sirloin steak and italian sausage. It might even have chorizo, who really knows… It also has strange ingredients like chocolate and espresso powder, but there is just something about it that makes it the epitome of comfort food. With a little cheddar cheese and cornbread or like last night we had blue corn chips; it just screams home. I knew that the chili was going to be made so after work I ran over to Great Grapes in Cary. I had forgotten they were have a huge sale and wine tasting, but managed to slip in and out pretty easily. It really is Great! now that they have more room with that newly built other side. I walked in and found the Zinfandel section, I knew I needed fruit forward, depth of flavour and a medium amount of tannin. (Fruit because of the chocolate and the spiciness. Depth of flavour to mingle with the chili’s depth and tannin to melt with all the meat.) I chose two different kinds, Truant and another from the same area, California – chili is such an American food and California has the best zins. I asked Lisa, a lovely woman I’ve spoken with before about wine, which she thought would better handle spice and stand up to the intense flavours in the chili – Truant. 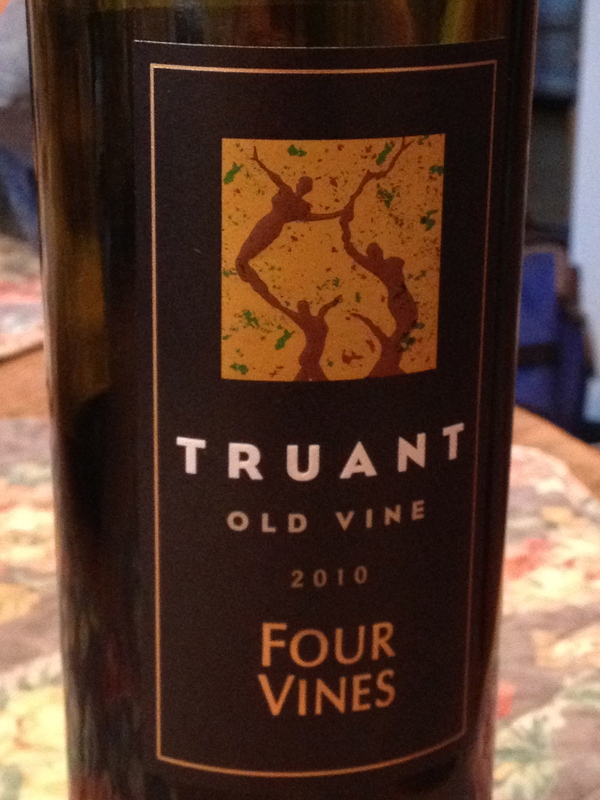 Truant is very new the Four Vines, formerly without a name, now fits nicely in their line. 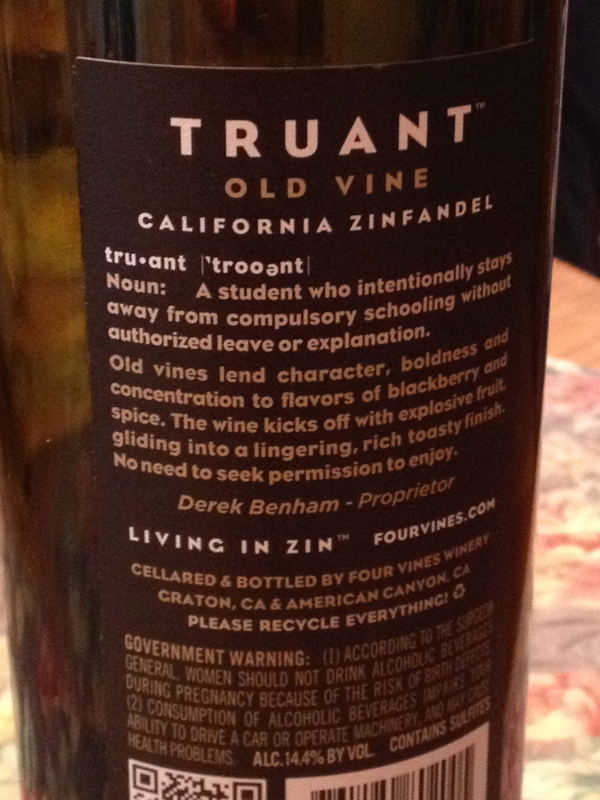 On the bottle they describe “Truant” as a student who intentionally steps away from compulsory schooling without authorized leave or explanation. As Four Vines describes it on their website, “someone who slips away from the confines of everyday routine.” Four Vines is a cool winery because they use grapes from all over and don’t simply pick from one appellation*. 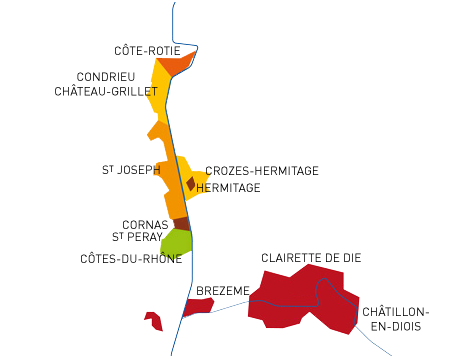 In this case Four Vines uses grapes from all over California to make Truant, it also blends other grapes with the main grape, “zinfandel.” Truant is 77% Zinfandel, 13% Syrah, 5% Petite Sirah, 3% Barbera and 2% Sangiovese. 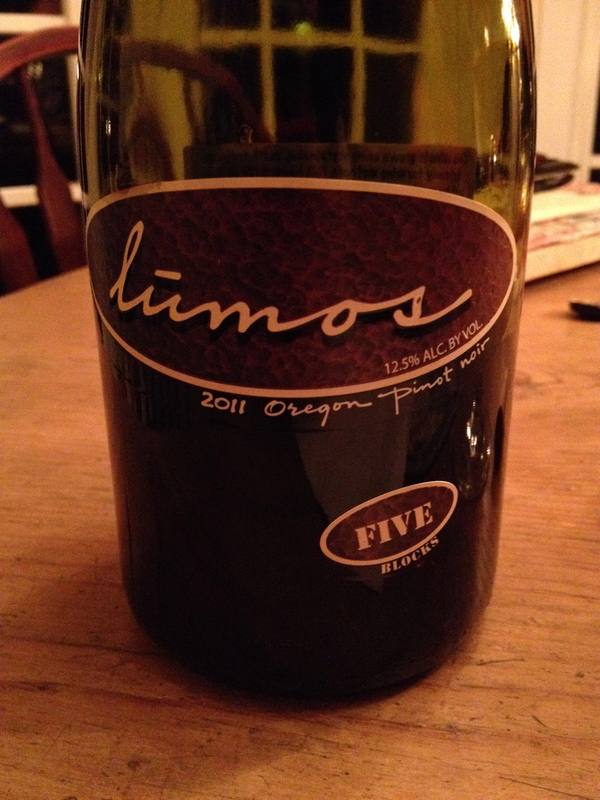 Tasting notes from the website are dead on, “On the nose there are dark berry notes and spicy notes from oak aging. The wine drinks of juicy blackberry, ripe plums and a touch of blueberry. 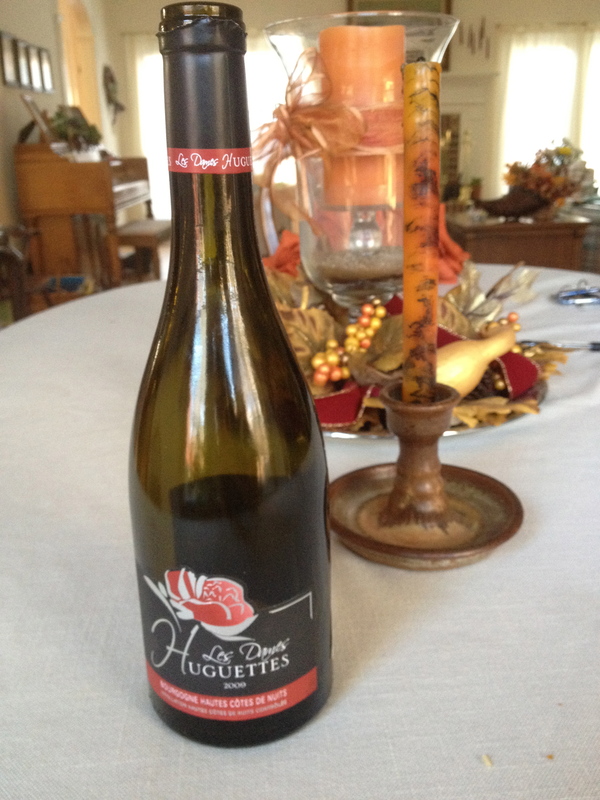 Generous in fruit flavors, plenty of structure and a velvety finish.” I loved that this wine wasn’t too spicy because it didn’t try to overpower the chili. 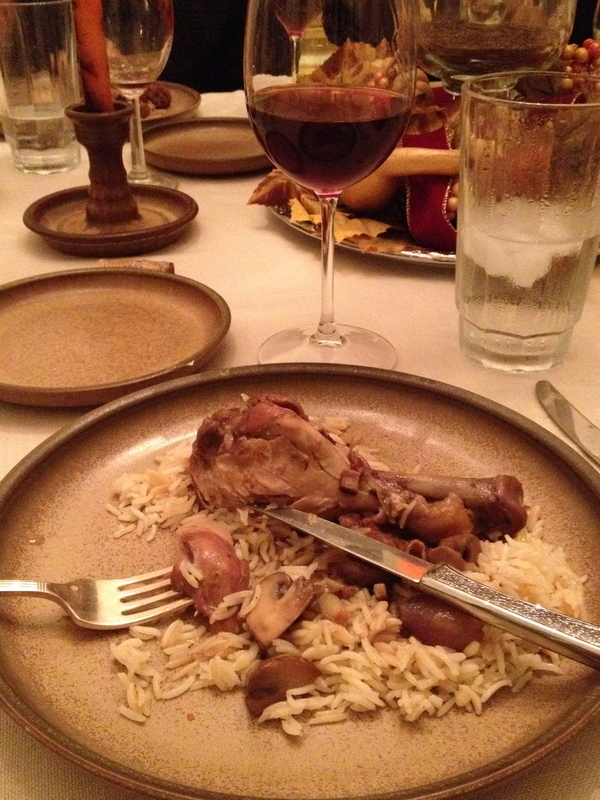 It also cooled the palate and increased the underlying hints of cumin, sausage and sweetness of the tomatoes. 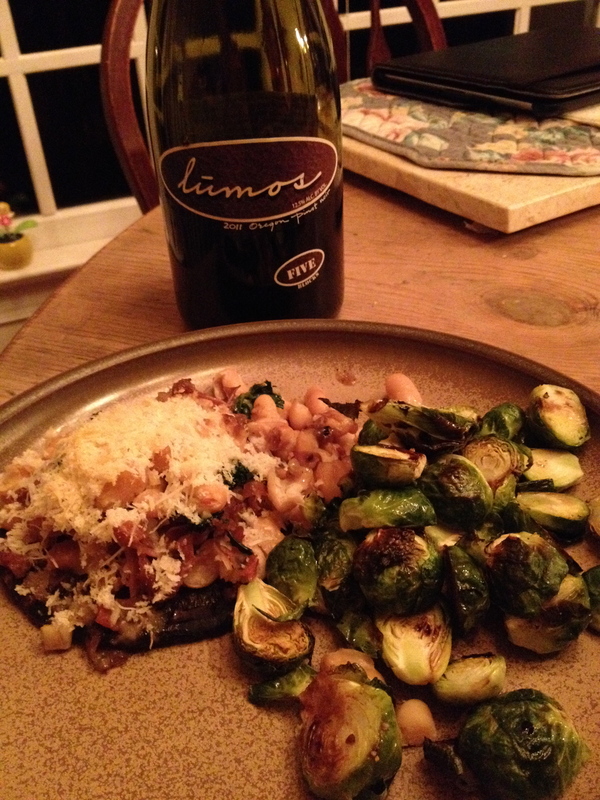 I thought this was a good wine and good varietal for chili because they worked so well together! If you’re going to be serving chili as we move into these Winter months, choose a wine to complement the chili’s good aspects – whether that be intense spice, intense flavour, lots of earthy beans or more beef. Whatever you’re chili is like, it’s hard to lose with a nice Californian Zinfandel.